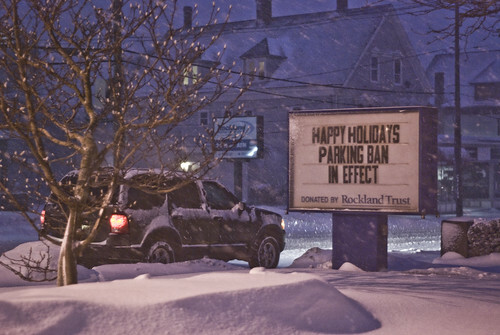 The Happy Holidays Parking Ban (328/365 year 3) – Annoyingly Boring? This sign in front of Town Hall always cracks my wife and me up. When we were coming home with the kids from Grandma and Grandpa’s on the Sunday after Christmas I asked if my wife would mind pulling over so I could capture it. While she’s not really ‘parked’ I think the car in front of the sign adds a bit of irony to the shot which made it the winner over the runner up for the day. That Rockland Trust …. they’re vicious. This needs to be sent in to Letterman or Conan. Priceless! Nothing says Christmas like ‘get off of my lawn.’ Great pic. i love this pic. i envy the snow. i think the snow would make the stupid cedar allergens go away. you HDR this a little?